A strong, robust, eco-friendly shark barrier. The Aquarius Barrier is the most advanced shark barrier technology in the world, combining the strength of heavy duty marine ropes with robust nylon struts that avoid marine entanglement. The Aquarius Barrier is strong, durable and also very cost-effective due to its simplified design. The Aquarius Barrier is a popular swimming enclosure designed for complete swimmer protection: it is a seabed-to-surface enclosure that provides an area to swim in the ocean with peace-of-mind. 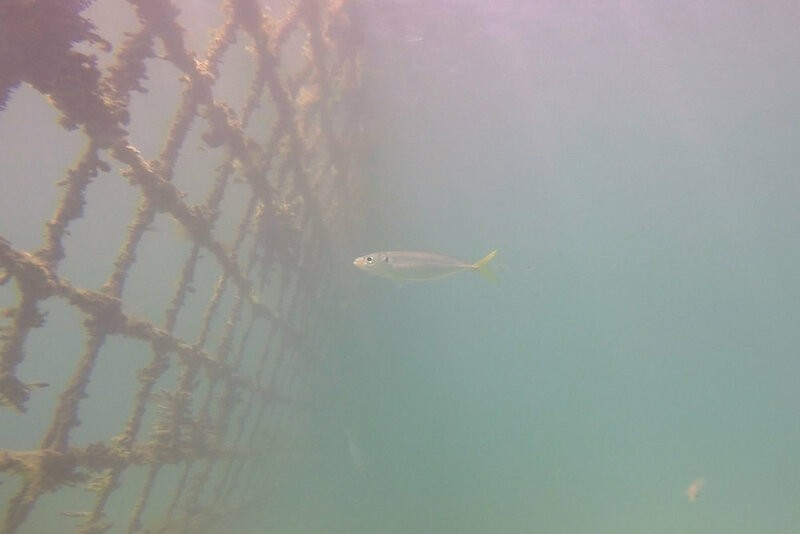 The eco-friendly Aquarius Barrier acts as an artificial reef, attracting a wide variety of fish and marine life. The growth on the barrier is mostly algae and after a few weeks becomes a rich feeding ground for small fish. The Aquarius Barrier features robust nylon struts that give it structure in the water, preventing the entanglement of marine animals such as dolphins, whales, dugongs, turtles, and rays. There has never been an incident of marine by-catch or entanglement in an Aquarius Barrier. One of the resident stingrays of Ellen Cove. The species is not harmful to swimmers so it is left in its natural habitat. Growth forming on Aquarius Barrier. Strong algal growth near the rocks as nutrients are washed in. 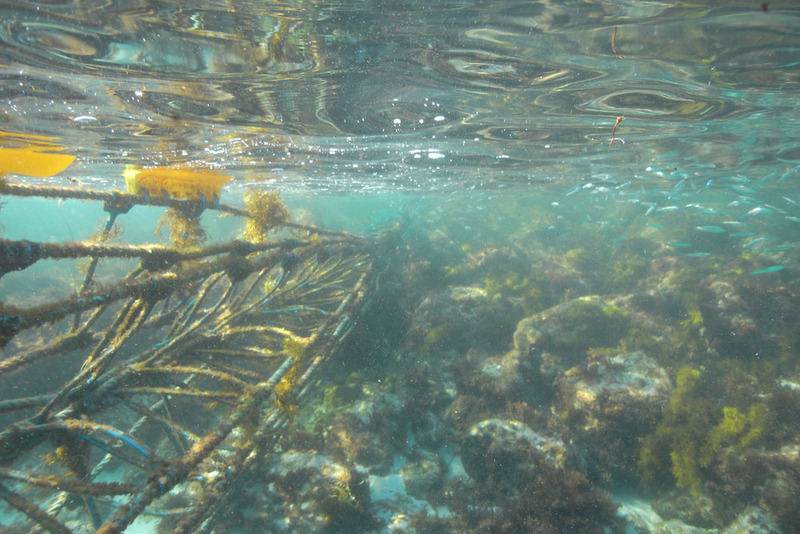 Algal growth tends to prevent barnacle growth, keeping the barrier lightweight. The Aquarius Barrier is folded neatly at the rock anchor and wrapped with Denso tape to avoid chafing on the rocks. The Aquarius Barrier is incredibly strong: it features a 7,300kg breaking strength horizontally and vertically. The strength allows the barrier to withstand extreme ocean forces in high-energy exposed beach locations. The barrier can remain installed all year round, depending on the environmental conditions and client requirements. 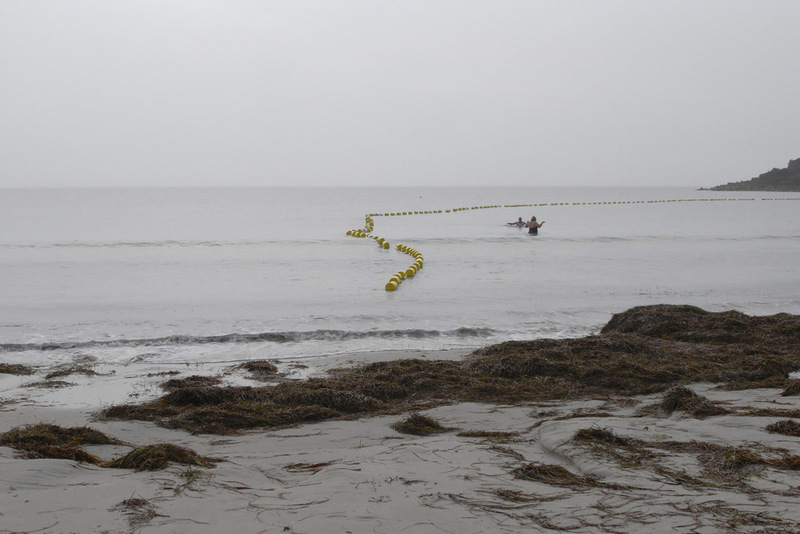 It can also withstand seaweed migration through the area. Each Aquarius Barrier is carefully designed to accommodate the needs of the community. Every community is different and every beach has unique interest groups and activities. We seek to understand every detail about these to design a barrier that is embraced by the local community. 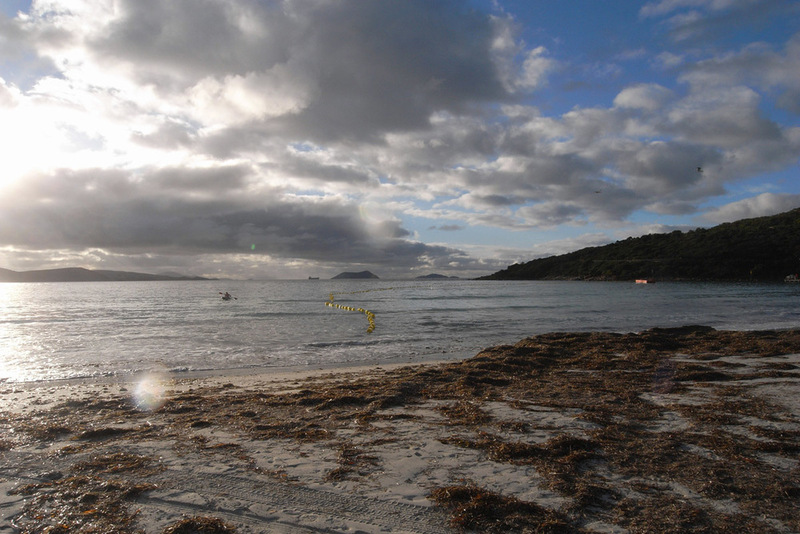 We have developed features for local Surf Life Saving clubs, swimming groups, kayakers and open water events so that the Aquarius Barrier is as unobtrusive as possible for regular beach activities. Swimmer's distance marker floats every 10m for swimmers to track the progress of their swim. Surf Lifesaving Club events and community open water swims held inside the barrier. The Aquarius Barrier is popular with swimmers in all seasons and is designed to remain in the water all year round. Kayakers can paddle either side of the barrier and can go over the barrier through designated craft access points. The Aquarius Barrier is a simplified design that combines strong marine ropes and robust nylon struts. The design has fewer components than its predecessors (with even greater strength) which minimises the overall cost. With longevity, durability and maintenance requirements considered, it is an extremely cost effective solution. The Aquarius Barrier is designed, manufactured and assembled locally in Western Australia. We produced a short video of the installation process based on our experience at Albany, WA. The Aquarius Barrier is anchored to the seabed with a system of concrete weights and stingray anchors. Each anchoring system is designed by coastal engineers MP Rogers & Associates to certify the barrier to withstand the specific wave action and loads at each beach location. See the animation of the anchoring system for Lennox Head in northern New South Wales. After developing of the Bionic Barrier, we found a few areas of the design that could be further progressed. Whilst the Bionic Barrier had set a new standard for shark barrier technology, we knew that the strength of this all-plastic design would not stand up to the test of extreme weather at exposed beaches. We went back to the drawing board and sought to develop a simplified design that integrated the strength of marine ropes with the structure of plastic components. After a few months of trialling new designs and concepts, a solution was found that brought together heavy-duty ropes and vertical nylon struts. The new design, the Aquarius Barrier, improved the breaking strength by a magnitude of 17x and halved the square metre price of barrier components. 'Aquarius' is said to represent a social conscience, humanitarianism, philanthropy, and a desire to make the world a better place. Aquarians are also said to be visionaries, progressive souls, inventive and original thinkers. Like the zodiac sign, we are trying to make the world a better place through innovative design and inventive solutions to a difficult problem.